Stronger Bottom shaft for Winters Extremeliner. Landracing Forum Home > Tech Information > Steering - Suspension - Rear End (Moderator: Seldom Seen Slim) > Stronger Bottom shaft for Winters Extremeliner. I have designed a new bottom shaft that will be made from 300m. It should be about 51% stronger than the 300m offered by Winters. If you want one, let me know and I will increase the order qty. They will be about $1000 a piece. If we get more orders, they will be cheaper. I'm having (3) made for myself. The stock shafts are only 1.062" diameter in the narrowed "flex" section. Our shafts will be 1.220" diameter in the narrow section. I believe the 1.062 diameter was chosen to clear the ring gear on the 4.86 champ rears. Re: Stronger Bottom shaft for Winters Extremeliner. I am just curious, did you happen to break the original shaft? Reason I am asking is that by increasing the size by 51 percent will the shaft still be able to have some torsion? 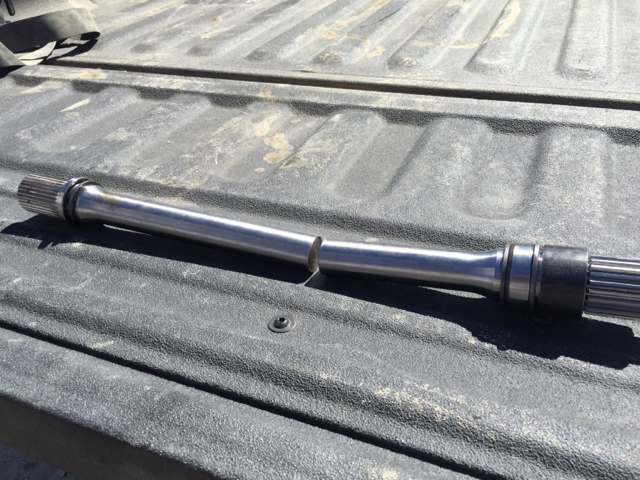 I was told that was the reason Q-C manufacturers sized the bottom shaft the way they do. Are you increasing the dia because of stress? If so what is your calculated stress? I agree with Tom regarding one of the purposes of the small dia is to attenuate shock loads between the input and the change gears and the ring and pinion. Yes, there will still be a necked down and it will be the smallest section but not nearly as small as original. New shaft design should be 51% stronger not 51% bigger. Yes. We did break the original shaft rather easily. I also have very long axles that should also help with the transient torque spikes. Ugh...those pictures bring back memories of a long 2 days in a hot dry dusty world! Just for $hits and grins do you happen to know the hardness of the failed shaft? The failure is characteristic of a ductile material torsion failure, normally if the material is heat treated to a fairly high level and therefore more brittle the failure in torsion has a 45 degree failure path. Maybe the stock shaft needs a better heat treat. 300 M can certainly be taken to hardness in the 40-50 Rc area without problems of being to brittle. The difference in tensile strength between Rc30 and Rc40 is about 25%. BTW what did Winters have to say? Obviously going to the larger shaft will probably eliminate the shaft failure but may just move it to a different spot. And you do have long axles which should help attenuate shock load for the drive train. Thanks for the pictures and information. Sorry about the mistake of 51% bigger instead of stronger. 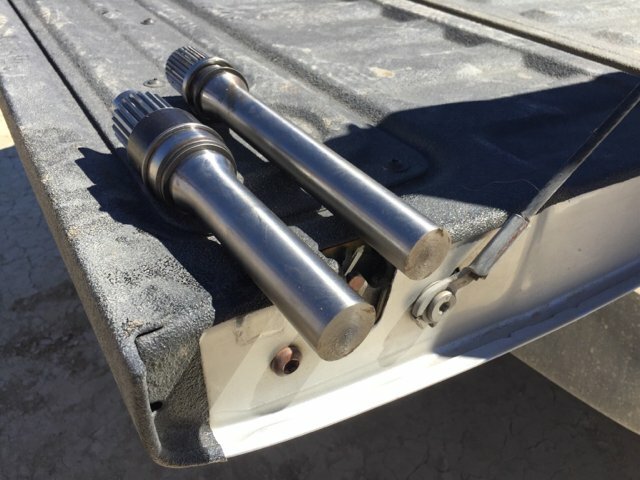 Do you know if the bottom shaft in the Extremeliner is the same as the Champ style Winters makes except for the larger diameter and more splines for the Q change gears? If not no problem as I can call Winters and ask. Rex has some good questions. Just a comment, pictures are deceiving. Be careful the shaft increase in size does not get larger than the root of the smaller splines. You may have to work on that also. As Carroll Smith wrote; All Failures are Human in Origin. After seeing the picture of your two piece lower shaft it brought back memerys of a similar experiance I had a few decades ago in my roadster. Just for the hell of it here's the short story about my lower shaft failure. After breaking the lower shaft in my Halibrand I changed to a stronger one next failure was the ring and pinion fixed that problem with a ring gear snubber next I found the input shaft on the four speed was now twisted next point of failure after input I think would have been the crankshaft. Good times doing this back yard hot rod stuff. With the injected Chevy in my street roadster, along with the Hydramatic/early V-8 torque tube Cyclone quick change, I kept over 30 lbs. of air in the rear tires at all times. That didn't eliminate breakage, but it cut it down. I bought a Parilla motorcycle to drive to work when I broke the roadster or when it rained. Took the front fender off, too. Just as bright today, unfortunately, as I was then. I think the old shaft was only about 30Rc. Yes. New "small diameter is 1.22" dia and minor dia of splines is right about 1.300. Snap ring dia are about 1.286". I am not going to dig up formulas, only share what I see. The main shaft reduced section is to absorb the torque in a place away from the circlip grooves. The reason for this is that the circlip groove is very short and makes a very concentrated stress riser. The difference in size between your new shaft and the groove is only about 0.033 per side. I may be wrong, but I would expect the shaft to break there next. Now, if there is a way to eliminate the circlip groove, you could get the larger dia to live. John, it's obvious you know what you're talking about. I have adjusted the 1.22 diameter so that it "goes red" on FEA the same time that the snap ring grooves and the minor dia of splines do. The shaft will still torsion twist at the 1.22 dia a few degrees at max torque. I may actually adjust it to 1.20 dia to make sure it is the weak link. Even then, 1.20" is substantially stronger than 1.062". Vaughn Winters is convinced that the material change alone has solved the problem. He said that nobody has broken one yet. My math says the problem is not solved. We can put down way more torque than anybody else in low gear. Even with these changes, I will have to limit low gear boost to 11 psi to keep crankshaft torque under 1300ft/lbs of torque as it will be multiplied by 2.48. Winters will not be paying the $5000 plus bill to get our car and team back in forth to the salt never mind the heartbreak and labor of fixing it or worse yet a spoiled back up run. I offered to pay for a run of these shafts to be made with an increased torsion section and an increased relieved section behind the QC splines (increased to minor diameter). They couldn't be bothered. We are in the meat of race preparation season now so they are crazy busy. I was a little upset that they would not share the spline information so I could have someone else make them. It's not a big deal as I can reverse engineer them but why make it hard for me. It's not like I'm not buying their stuff.